I will argue that everyone has a preference about something. We prefer to dress a certain way, to eat certain things and we certainly have preferences when it comes to dating. But where is the line between just a preference and superficial hindrance in your love life? I encourage everyone to be attracted to whoever they are with, but sometimes I feel people take things a bit overboard. 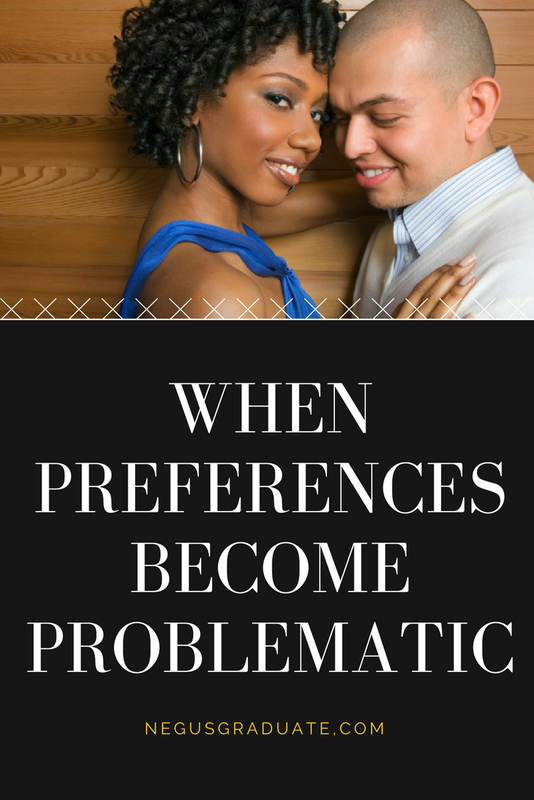 Preferences in dating can become an issue when you start to demand a person to be something that you aren't. You aren't expected to be your soulmate's twin, but you can't judge someone for not having something that you aren't even bringing to the table. How can you curve someone for not being fit when you aren't? How can you fix your lips to talk about someone being broke when you're a cashapp beggar? Humble yourself. You need to rise up to the level that you expect your mate to be on and willingly hand out the same grace and patience that you'd like them to provide to you. Some people are so committed to their preferences that they are willing to miss out on a good thing. A great example of this is Sam from Dear White People. Sam liked Gabe. He was someone that was always there for her, he listened, she could be he whole self around him and not just an activist and he really cared about her. The issue is Gabe is white. He didn't fit into the vision she had for herself about being a pro black woman with an equally passionate black man by her side to fight against social injustices. So she ignored her feelings for Gabe and reduced him to friends with benefits. A blessing is a blessing even if it is not what you expected. This also reminds me of an article I read a few years ago "I Married A Guy I Wasn't Attracted To". When I first read it I viewed it negatively. People deserve to be with someone they are attracted to and people deserve to be with someone who is attracted to them. Now I get it. The author Kay explains that she wasn't initially attracted to her now husband. He didn't fit the physical description she had in mind. Even when she started to noticice that she liked spending time with him she tried to separate herself from him because she disliked the idea of being interested in someone that didn't fit her vision. Just imagine if she would have walked away she wouldn't have her husband today. Sam and Kay weren't outright wrong for having an vision about what they want, but it's the fact that they were closed off to anything else. If God presents another opportunity to you don't count it as any less of a blessing just because it isn't wrapped how you thought it should be. Be open to a world of endless possibilities. Most people I know who are married admit that their spouse isn't an exact match to the dream person they had in mind, but they are happy. It isn't settling. It's just embracing something different and a lot of times even more than what they expected. We have to take ownership of our love lives by analyzing if the way we go about picking a potential mate is healthy. Also keep in mind that we don't always know what's good for us. Some of our preferences are toxic and we don't realize it. We just chalk it up to "I like what I like" but some of us should be working on changing what we find attractive. Have you ever been around someone who repetitively gets into relationships with toxic people? It's because that person has some sort of preference for that type. No, the person isn't going around searching for a toxic person to fall in love with, but it's something toxic that they are clearly attracted to. "Your Type" by Jamie Foxx was written for this very situation. Don't try to find someone who fits the type and change them (because changing people rarely works). Figure out what toxic traits you're attracted to, why you're attracted to them and how to unearth them. Or figure out why you aren't attracted to things. I used to not want to date anyone in the medical field because I'm creative and I thought everyone in the medical field would be boring. I didn't want to date someone who wore scrubs daily or always talked about body parts. I've since met some awesome people that I'd never think were in the medical field. Turns out I had a childish misconception. Is your preference worth counting out an amazing person? Sometimes our preferences are just that..childish. I had a friend who used to point out the most random things to not like a person over. His ears were too pointy or his fingernails were oddly shaped. There's a difference between being flat out not attracted to someone and being extremely picky. Somethings that people are willing to curve someone over are either very small in the scheme of things or can be easily fixed. Great example: my friend's husband prefers for her to have her nails done because he likes the way it makes her hands looks so he pays to get them done for her. See! Easily fixed. It's crazy to me how people are willing to put in more work (years!) to fix the inside of a person than the outside when the outside can be more so easily upgraded. Or you can just grow up and accept it. I love abs, but I've definitely been interested in men who don't have them. It's not a deal breaker. We all have flaws and I'm open to accepting them just as I hope to meet someone who will accept mine. Preferences aren't bad within themselves it's all about how you go about it. This article isn't to get you to settle, but to make you more mindful about what you like and why you like it. Also to get you to be more open minded. Some of the most amazing things have happened in my life when I stepped outside of my preferences. By all means be attracted to whoever you're with, but be careful not to cross the very then line of being superficial. When it comes to appearance we all have flaws, looks can change and even our preferences change. What matters the most is a great unchanging heart. When you get one of those you're set for life.